Péter Szijjártó is 38 years old and has a degree in sports management. He loves soccer, just like Prime Minister Viktor Orbán. Szijjártó served as spokesman for Orbán prior to being named the Foreign Affairs and Trade minister at the age of 35. He had no previous diplomatic experience. 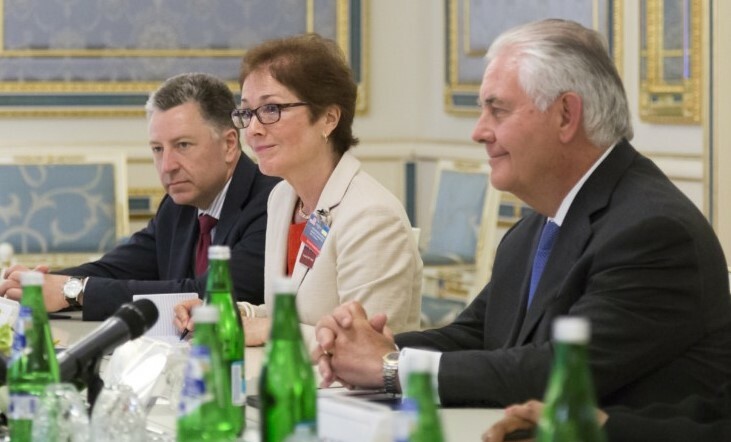 Marie Yovanovitch is a 59-year-old career diplomat who has served under Republican and Democratic administrations. She is a Princeton graduate with 30 years’ experience in Foreign Service. She was Ambassador to the Kyrgyz Republic, a foreign policy advisor, the undersecretary of state for political affairs and also completed various assignments in Ottawa, Moscow, London and Mogadishu. Now Mr. Szijjártó says that Ambassador Yovanovitch doesn’t know what she is doing. Mr. Szijjártó was “shocked” that the Ambassador greeted the new law positively in a Twitter message. He says that she is misinformed and not familiar with the text of the law that specifies Ukrainian as the main language to be used in country’s schools. He says that the Ambassador does not pay attention to details and that her behavior is symptomatic of the criticism the Orbán government receives from many foreign sources. Szijjártó has already summoned Ukraine’s Ambassador to Hungary to express that the new law is “shameful and outrageous.” “Hungary is going to withhold support for all Ukrainian initiatives in international organizations, as well as for causes important to that country,” he thundered. Then he declared that it is Hungary’s duty to protect all Hungarians, whether they live in the country or abroad. The Orbán government has every right to use diplomatic measures to support its policies, but it is unwise to launch such a personal attack on a US Ambassador. And it is unacceptable to insult her by stating that she doesn’t understand the text of Ukraine’s educational law. The US has policy goals in Ukraine and Ambassador Yovanovitch has represented them. Hungary’s theatrical anti-Ukraine posturing indicates that the Orbán government is not working on a diplomatic solution. David Kostelancik, the charge d’affaires at the U.S. Embassy in Budapest, has encouraged negotiations between Hungary and Ukraine to find a resolution. Foreign Minister Szijjártó’s new attacks on Ambassador Yovanovitch are worrisome and won’t help matters. Hungary should replace Mr. Szijjártó with a seasoned diplomat soon. Not just Hungary, but Romania also attacks Ukraine for eliminating public education in Hungarian and Romanian languages. Wonder about the Moldovan and Russian language education? God, Szijjarto is a Cretin, no other words really , he couldn’t even run a municipal Swimming pool like the rest of the FIDESZ. You got it all wrong Mr. Lazar. Assuming that she must not have understood the text, is in fact letting her off the hook, or giving her the benefit of doubt. Because if indeed she understood, then what was she doing praising it? Does she get a kick out of laws that oppress minorities? Does she represent US views on this? If so, then it reflects very poorly on the good old US or A! If it does not, then your much-praised US diplomat should be reprimanded by the US administration. And you say that Hungary needs to change its diplomat? Once more Mr. Lazar, no anti-Hungarian bias on your part. None whatsoever! Nothing exceptional, the ignorant arrogance of the half baked provincial parvenue has been the norm here, e.g. the Orbán lecturing about the European, i.e. Hungarian, mindset, as opposed to the Russian one, with the Russian ambassador facing in the first row. The gradual decline in the standards is to match those of the leader, see the repulsive Budai, A.Talai and the unsurpassed Szilard Németh (Dr. Lambroso triumphant). Pks desist with the idiotic argument that a high foreign official or diplomat doesn’t know or understand because he/she doesn’t know Hungarian. And pray that the Ukrainians don’t follow Orbán in his strive for “ethnic purity”. Dear Observer, please inform yourself in regards to Hungary’s policies in regards to historical minorities, which includes education in their own language and cultural self-administration in their own language. I do hope that your Ukrainian fascists would take note and follow Hungary’s example on this one! Fat lies about “historical minorities …education I their own language” – e.g. there wasn’t a single school in Felvidèk (Slovakia) with Slovak language instruction until WWI, tens of thousands of German, Jewish or Slav origin Hungarians changed their names in the 1930s, etc. The more one reads this history the more one understands why Hungarians were are disliked or hated in the region, why “God strikes the Magyar”. I am talking about the present! Hence the steep fall in results, e.g. PISA stats. That’s how one destroys a nation by dumbing its youth down. You are not improving the credibility of your argument with such hysterical outbursts. First you resorted to referencing events from 100 years ago, from a different time, attempting to vilify Hungarians by putting those times withing today’s context. In those times, most Western countries did not even have democracy, and those who did, did not allow women to vote. Now you go into this hysterical description about Hungary’s education. If one looks at PISA, Hungary’s results more or less reflect its GDP/capita level, as well as the fact that it was recently a Ward of the IMF. Of note, in math it did better than US. An honest response would have been to acknowledge the fact that Hungary has a decent record currently in regards to historical minorities, which Ukraine could learn from. That is the subject of this conversation BTW, not PISA, not ancient history. But, of course, you cannot do that, because you cannot say anything positive about Hungary. Don’t know how my figures can be hysterical, but your reaction seem so. PISA findings show the downward trends under the Orban rule – the Hun youth is being dumbed down. Yes, the minorities in Hun enjoy a good status, which btw was created 25 years ago. Like I said, this has nothing to do with PISA. It was a pathetic attempt to change the subject. As for the original comments “ethnic purity”, “fat lies”, thanks for finally admitting that Hungary does to pursue the assimilation of its historical minorities, like Ukraine is striving to do. It must have been very hard for you. Your initial attempt to substitute Hungary’s record from over a century ago with today’s record was rather pathetic and insulting. It also betrays the fact that the starting point in any conversation with you is one of extreme bias & hostility against Hungary & Hungarians. You are the worst enemies of Hungary are rotting and/or purposefully destroying the fabric of society (as no outside force can do) and robbing/impoverishing the country. Thousands of the Orban mafia would be sentenced as common criminals in any rule-of-law country, e.g. Orban should have been imprisoned in 1999 for the 1.2 billion subsidy he “awarded” to his wife’s vineyards. This is for you too, bleating the Orban propaganda lies doesn’t go here. It seems that in spite of Mr. Lazar spending months each year in Hungary, he is not grasping the importance of educating young Hungarians in their own language in the Ukraine. Maybe he does not care. If he did, he would agree with Mr. Szijjarto and appreciate the importance of the great work the Hungarian Government is doing in the interest of Hungarians around the world, regardless where they live. As to the experience of Ms. Yovanovitch, just because she “has been around”, it does not mean that she fully grasp and appreciate the issues in this case. It seems that Mr Lazar, do not appreciate it fully either. Pls don’t repeat the idiotic argument re “not understanding” because someone isn’t Hungarian. The grades are enough to learn written Hungarian, which they presumably already speak at home after which they can continue to learn extra curriculum. As a small minority the ethnic Hungarians don’t stand a chance to prosper in any country if they don’t perfect the majority language and graduate in high school and uni. Small Hun language uni level courses would be academically inferior and the diplomas would be good only for work in Hungary, perhaps. Finally, the Orban regime is doing a perfect job of ruining the image of ALL Hungarians abroad, I can attest to that happening. The little fascists here and abroad may bask in this moment of their self congratulating pigheaded “glory”, but this doesn’t change the reality of the Magyars shooting themselves in foot, again. Insulting the US Ambassador to Ukraine is not “great work”, I think it is highly counterproductive since I’m sure that Amb. Yovanovitch perfectly understood the text of the law. By the way, there is no need to attack me either…. Dear Mr. Lazar. You forget the fact that it is Amb. Yovanovitch, which you so admire who threw the first insult. It is an insult, first and foremost for the millions of people that belong to a historical ethnic minority in Ukraine. It is an insult to America’s partners in the region, such as Hungary, Romania, Poland, Slovakia. As for the comments of the Hungarian foreign minister, you see it as an insult, I see it as giving her the benefit of the doubt. Because the only other alternative is that she is a sympathizer of Ukrainian nationalist-fascist ideas & policies. There is no third option, given her praise of the law. For me, ignorance is the better of the two. Or do you think she should have been called out for being a Ukro-fascism sympathizer? Would that be any better? As for you, I am sorry if you feel insulted by my assessment of your articles being anti-Hungarian, but they clearly are. In this article for instance, you attack Hungary for standing up for the basic rights of ethnic Hungarians in Ukraine, while praising the one who declared her suport for such abuses against historical ethnic minorities. And it is not the first time you declared yourself against the interests of Hungary & Hungarians. I understand you do not like the current government, and that is 100% fine. It is when you not only attack them, but also Hungary’s interests that you end up crossing that line. You have to learn to separate the two, if you do not want to be called out on it. It seems even Hungary’s opposition parties finally learned this lesson, as they all came out against Ukraine on this one, as they should. I think the reason you cannot is because Hungary will never be able to do right by you, unless it fully embraces the globalist agenda, including ethno-cultural suicide, 100% servitude to the globalist cause and so on. That is a very heavy price you are demanding for your native country and ethnic kin, just to gain the approval of some ordinary expat. I sense a vehement anti Magyar theme in these comments. Magyarország will always stand behind its own citizens and put them first in everything across the globe. This is an example sadly not mirrored in other countries. As a result the evidence of the degrading in European culture is only too apparent. I almost begin to suspect that certain people may very well be on the payroll of Soros. Degraded is the Hungarian culture, by the primitive, greedy thieves mascarading as government, elected by idiots who bleath the “Soros” lines while Mèszaros (aka Orban) has been robbing the blind. Yes, I have vehement anti Orban mafia themes here, because they are the worst enemies of the Hungarian nation, the tragic results of who’s rule are clearly showing.